You see, early last winter, I decided I wanted to start a personal blog. Freshly started in graduate school and navigating my second year of marriage and my second pregnancy, I looked forward to the second trimester after Christmas and planned to blog about embarking on my crazy “adult” adventures. I had my second miscarriage before the end of the year, but despite that, I still went live with my blog on January 1st. I befriended random people, people with writing or publishing connections…on occasion, though, I would type “miscarriage” into the topic search bar and look for other bloggers out there who had been through what I’d been through. And that’s how I met ACalmPersistence. What followed was a good string of at least five, if not a few more emails back and forth. I was just starting to navigate my way through the world of RE’s and infertility testing and procedures, and I was terrified and missing my babies. She was in the midst of it and was more than willing to offer advice, and to share her experiences, and just be a generally nice person to me. It was a relief. It was she and another blogger that I became friends with for different reasons (who then suffered her first miscarriage shortly after I started following her) that most likely led to the creation of this blog. I realized that there were others out there like me, suffering in silence and bearing a pain we can’t see or touch. I realized there was a place for me. And these months, following my second miscarriage and during the seemingly never-ending four months of testing and procedures, held the darkest days I’d had in a while. I was struggling. And getting on Twitter and WordPress, even anonymously, honestly helped me heal. And it all started with her. And Saturday afternoon, after a few hours looking at houses with my husband, we return home to find a package sitting on our doorstep. What waited for me inside brought me to very literal tears. 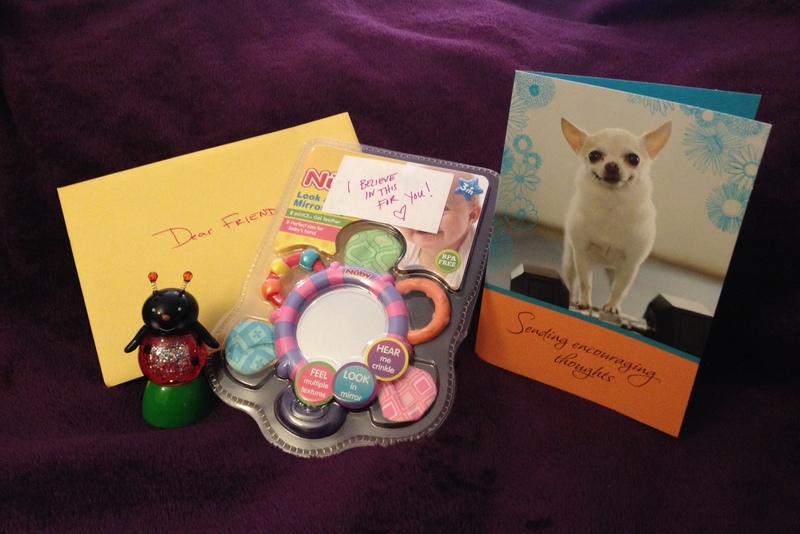 A little light-up ladybug, a envelope marked “Dear Friend” with a card and heartfelt note written inside, and finally the piece that actually made me catch my breath: a little teething ring/rattle. The very first actual baby gift I’ve received in my life. I was overwhelmed. I knew something might be coming for me eventually, as she’d obviously asked for my address several weeks earlier, but this…this…I was not expecting! I let out a yelp, as I was sitting on my bed resting when I opened the package, and my husband came in asking what was in it. When I showed him, he just smiled. I told him who it was from and he said, “She didn’t need to do this.” I couldn’t agree more. This, coming not even 24 hours after she announced on Twitter that she’d confirmed her fourth loss. My heart, although happy and thankful, was breaking for her. For someone to be going through her own struggles and yet still take the time to reach out to someone else and root for her the way she has for me…words can’t do my gratitude justice. I’m sorry, this is an awfully mushy-gushy post. But I feel like I owe it to her. I owe it to her to let you all know how lucky you are to have someone like her as a friend in this community. She truly is a one of a kind person.